The latest quilts in our bi-monthly group quilt challenge are finished and ready to show. Brenda, Candy and I are midway through our color themed challenges, with just one more to go before we start a new theme, one that we’ve already mapped out and even purchased fabric for… but wait, I’m getting ahead of myself! 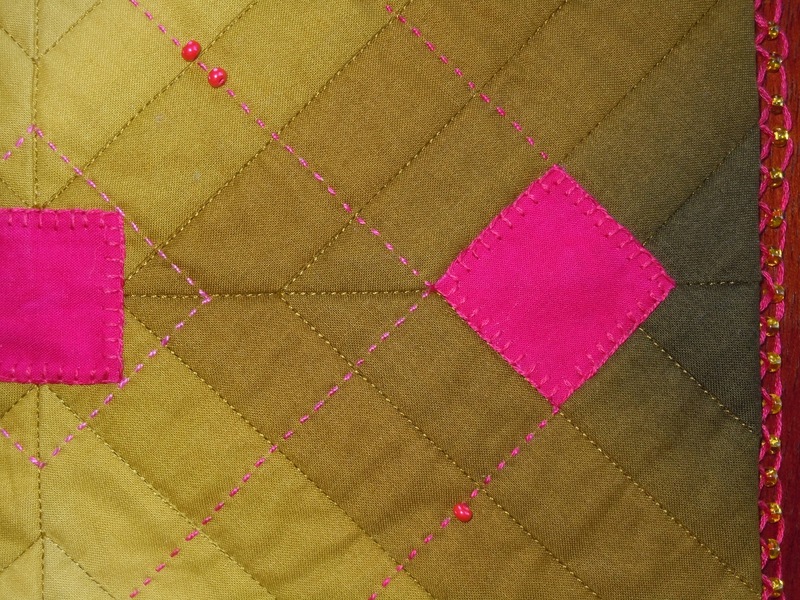 I had some fun with this quilt… and I had some frustrations. My vision was for a simple but bold piece, with minimal elements but big impact. The ombre fabric I counted as one color – maybe bending the rules a little. And I have to say the puckering was unintentional, but I had reached the point that it was “in for a penny, in for a pound”. 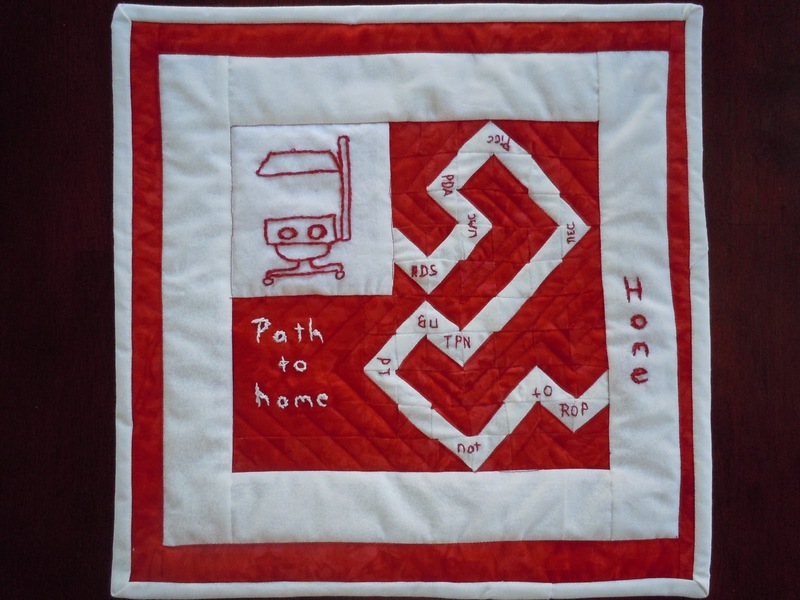 Brenda wanted to try red-work and designed a quilt documenting the journey a baby might take through the NICU on it’s way home. An isolette, open for use as a radiant warmer, is embroidered in the upper left. 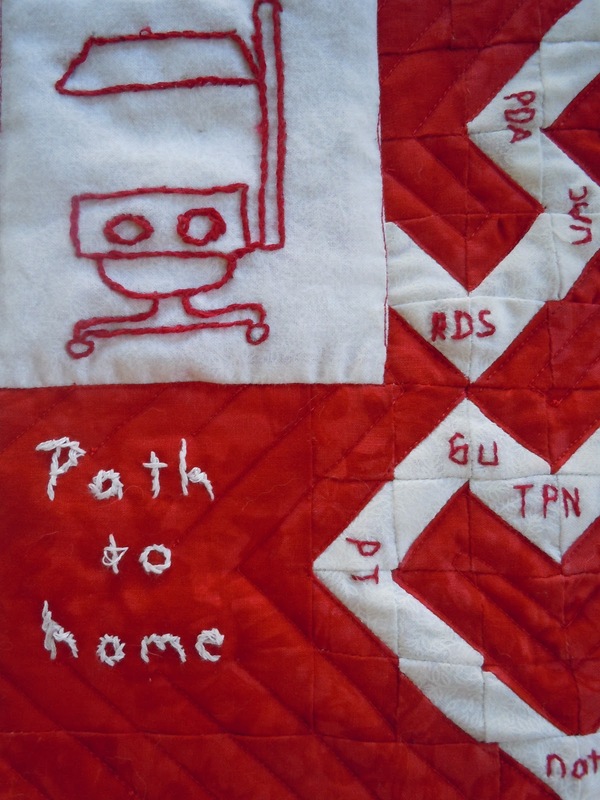 Along the pieced path are embroidered acronyms for common terms in the neonatal world; things like RDS (respiratory distress syndrome), UAC (umbilical artery catheter), and TPN (total parenteral nutrition). Working on our One Color challenge quilt I worried that my work was “too crafty” and I was not happy with the result. For our Two Color quilt I decided to throw away worry and embrace “crafty”. I made just about every element of this quilt. The back ground is a woven 8-shaft overshot, cotton warp with silk weft. The braid was woven on a Maru Dai that my wonderful husband, Tom, made for me. 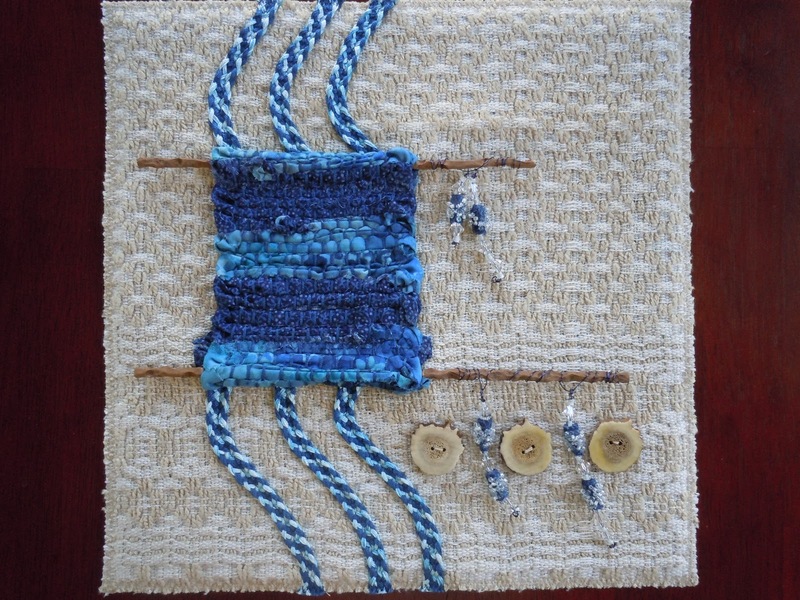 He also, graciously, made me a small, simple table loom on which I wove the dark blue cotton rag rug embellishment. 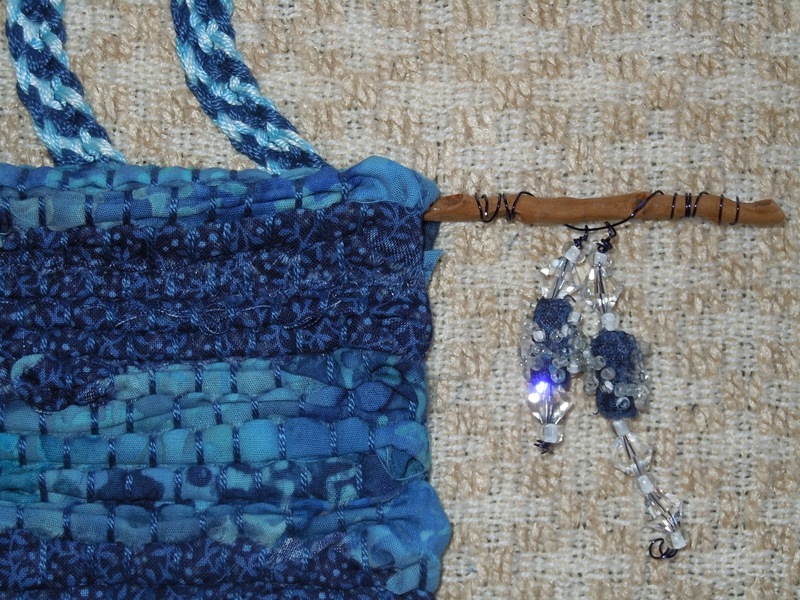 The blue beads were made from left over cotton fabric. My DH pointed out that it is not really a quilt. I guess strictly speaking he is right, so let’s call it fiber art that qualifies as a quilt because it’s 3 layers. I had so much fun creating my challenge piece that I defy the Quilt Police to rain on my parade! Nope, there will be no raining here. This is a sunny blog, after all! 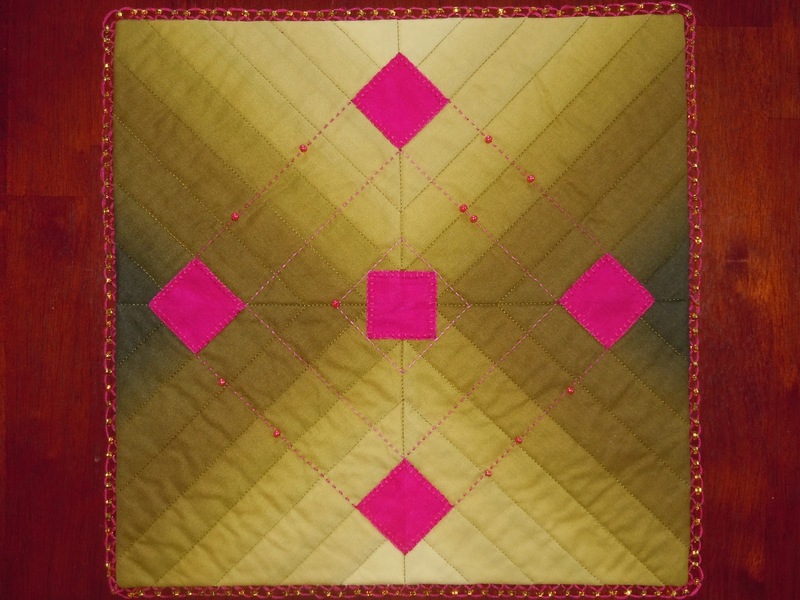 Hope you all enjoyed our two color quilts and check back again to see our take on the Three Color Quilt Challenge. Quilt on!